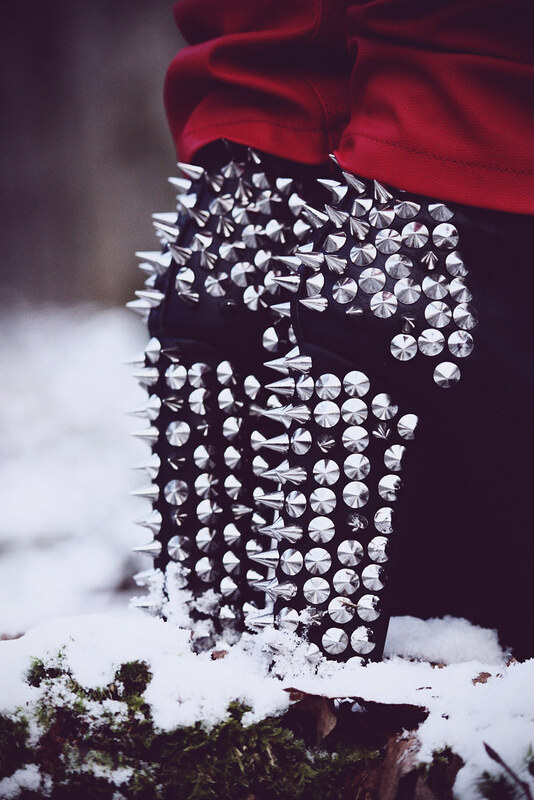 Mode Junkie: THE GIRL WHO PLAYED WITH SPIKES. THE GIRL WHO PLAYED WITH SPIKES. in this very second, i would have been in Paris munching on my Laduree macarons & waiting for my connecting flight to Copenhagen. but i decided to cancel the trip to fashion week yesterday because Miguel has an acute lung infection & mild case of bronchitis. he´s feeling quite better now but i know that if i went, i wouldn´t be able to enjoy the thing anyway. SO I STAYED. luckily, this will not be the last fashion week and i know fashion will wait. still a bit sad though. anyway, as if the fashion gods know that i am not feeling really well, my long awaited Jeffrey Campbell Lita Spikes from Nelly came in yesterday. what is it with shoes and moi? they always lift my spirits up. Great outfit - I love these shoes!!! I'm keen on your blog, follow me too?? Those Lita's are a piece of art, love the way the camera captured their true beauty. I just ordered mine yesterday and now that you've got yours I'm even more excited. I wanna wear them right now omg! I hope Miguel is doing better now!! For me this is just the perfect outfit! 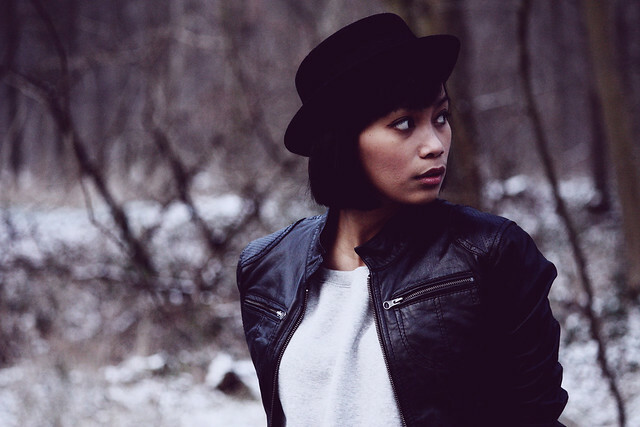 Love the edginess and still it's beautiful! love your jeffrey so so much!!!! Im so in love with this lita spikes from J.C!! 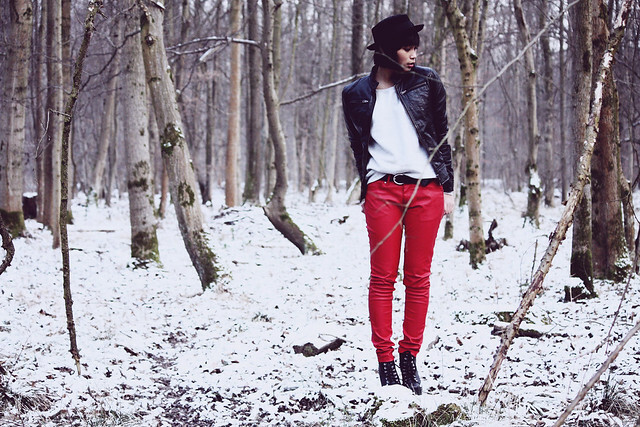 And i love your red pants is so hot and the contrast with the snow is beautiful. Anyway this is truely an amazing look! Those red pants are the best! Oh gosh!! I love the Spiked Lita's!! they look so gorgeous on you! love, love, loooove this outfit! And those J.C.'s are killer!!! Awh! sorry about Miguel, hope he feels better soon! dying over your shoes! so hot!! das outfit ist der hammer! und ich bin auch bei dir gespannt schmuckstücke von new yorker präsentiert zu bekommen. weil ich, und ich glaube viele andere blogger, stehen new yorker erstmal kritisch gegenüber. ich bin gespannt! Oh gosh hope Miguel is recovering well. So sorry you canceled your trip. But hey, you look fabulous in that outfit. 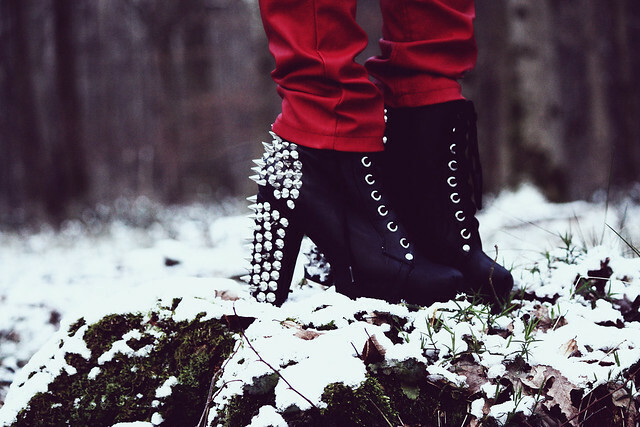 Those spikes are to die for. Great spikey heels from JC! I LOVE those shoes matched with the red and black leather. i love the leather pants too! Great blog! We loved it, already following you. THE SHOE PROJECT. PAIR NUMERO VI - X.